Hiking Kentucky's Red River Gorge is the definitive guide to trails in the Red River Gorge Geologic Area, Natural Bridge State Park, and Clifty Wilderness. The book showcases 25 of the best hikes in the Gorge, as well as a back-of-book bonus on nearby trails. 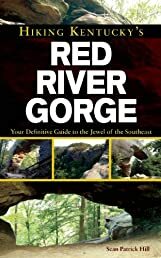 Distinguished from other Red River Gorge guides, this book provides readers not only with detailed maps, sharp photos, and individual-trail details, THIS guidebook outlines definitive hikesways to explore the area and enjoy its flora, fauna, and history.